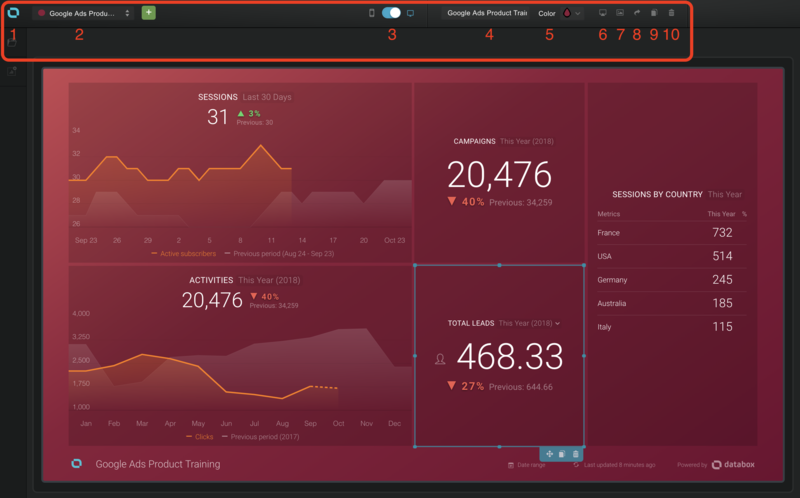 The Designer tool gives you the ability to customize your databoards with different metrics, time intervals, visualization types, logos, colors, and more. This article will take a closer look at the functionalities that make up in the Designer tool. The other option, Visualization Types, represents the various ways you can display your data (i.e., Line Graph, Table, Progress bar, etc.). This gives you the flexibility to choose a different Visualization Type that matches the way you want to present and consume data. Most Metrics work well with a number of Visualization Types and this gives you the freedom to use what works best for you and your use case. By selecting an individual Datablock, you open up the righthand panel, which displays the P roperties of that Datablock. From here, you can customize the Datablock to fit your reporting needs. Choose the Compare with option to view your metrics against the previous period, the average, the trend, the goal, and much more. Select a different databoard to open in the designer, without going back to the main page. Switch between Mobile and Desktop view. Change the name of the current databoard you're working on. Change the color of the databoard. Choose from the dropdown of pre-selected colors. View a preview of the databoard as it will be displayed to clients and on a big screen. 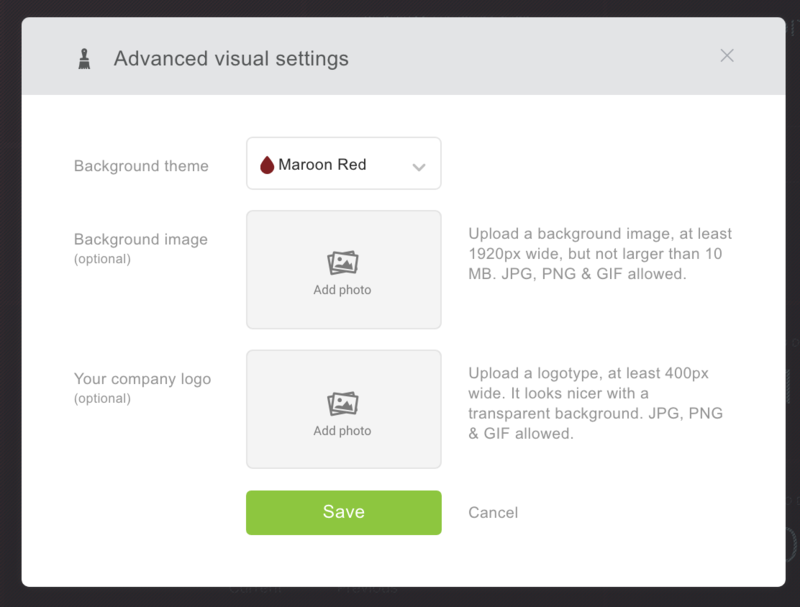 This icon lets you select Advanced Visual Settings. You can directly add a Hex Color Code to make sure it fits your company color perfectly. You can also add a background image and a company logo, which would be displayed in the bottom left corner of the databoard. 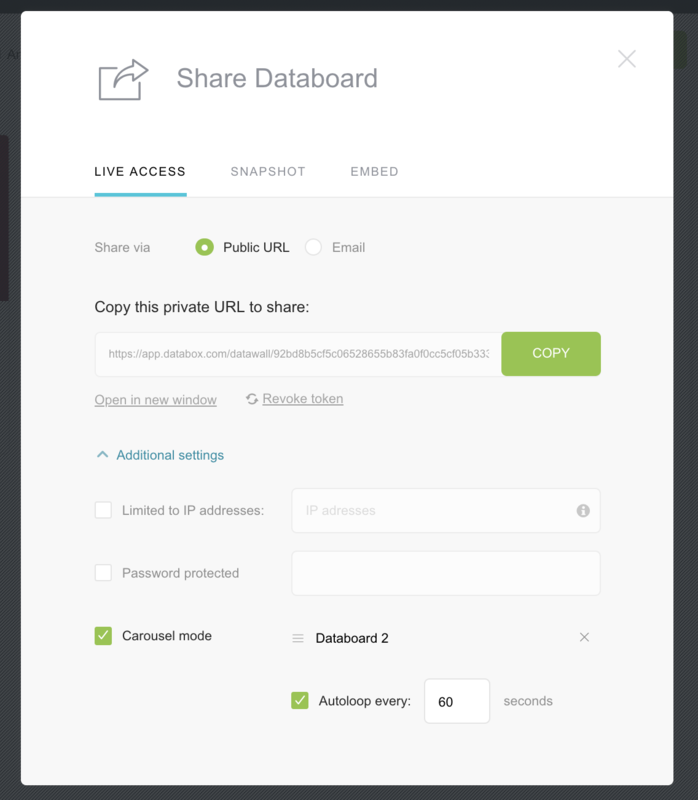 The Share Databoard icon gives you access to the Live Access URL that you can send directly to clients. This link stays up-to-date with current metrics, and reflects any changes you or your team may make to the databoard. However, clients with this link do not have the ability to make any changes to the databoard themselves. 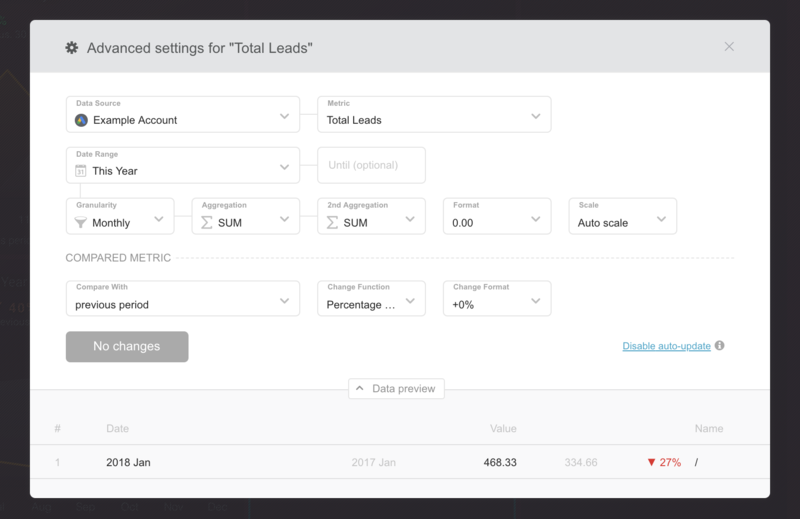 Carousel mode is great for looping databoards and really steering the conversation with your clients. Databoards can be automatically looped every x seconds, or you can manually click through the presentation. Restricted access allows for even more security by limiting viewing rights to certain IP addresses or by making databoards password protected. This icon gives you the ability to duplicate the current databoard. The best way to learn the functionality of this tool is to try it out for yourself! Play around with different visualization types, properties, and settings to truly understand the reporting capabilities that are made possible through the Databox Designer.